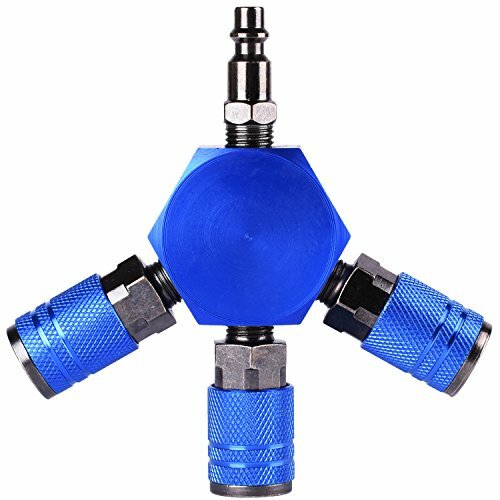 This is WYNNsky 1/4" 3-Way Flat Hex Manifold Air Connector. This manifold easily splits air lines into 3 separate lines and has durable solid brass construction. The blue body make the product more textured.Our line of manifolds allow the user to run multiple lengths of air hose off of one compressor or auxiliary tank. Equipped with a single mounting hole, the flat hex can be nailed to a roof or joist during construction. Divides a Single Inlet Out To 3 Outlets. 3-Way Flat Hex Aluminum Manifold. 3 pieces 1/4" Female NPT Outlets and 1 piece 1/4" Female NPT Inlet. Includes I/M Type ColorConnex Couplers and Plugs.